Thank you so much for giving us a fantastic holiday; affordable, varied and fun! When you book for a group of 8 or more, at least one place is completely free! Don’t forget that this offer runs all season long and is for every group of 8 so if you book for 16 people 2 places are free, etc. All resorts have a great variety of piste and lift pass options. 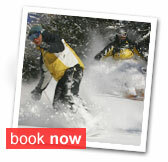 Our packages are very affordable for first time or novice skiers who simply want to ‘give it a go’ as well as offering more advanced skiers optional additions to enhance their holiday such as a full Three Valleys pass for stays in La Tania or an upgrade for skiing in Val Thorens and the Three Valleys for those staying in Valfréjus or La Norma. We know that letting everyone know about a holiday can sometimes be difficult and information can get lost, that’s why we're happy to come to you before your holiday to chat with your group about it. We’ll also include a tailored presentation to show you all what to expect when you arrive and get together any outstanding information that relates to the booking. If you prefer to take care of the details yourself, we can supply you with our group organisers pack to make things as easy as possible. Regardless of the size of your group everyone is treated as one of our friends. Our staff are here because we love the snow and because we want you to be as enthusiastic as we are. We regularly ski with our guests and arrange group events like sledging races, just for fun and (when it’s your round) I'll have a large one, thanks!